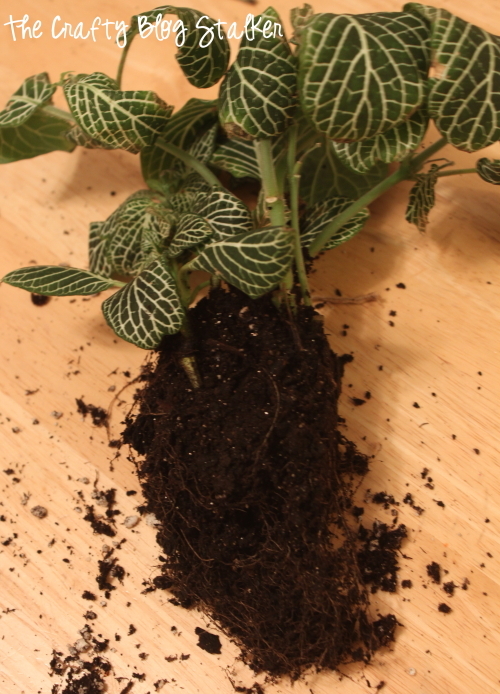 Keep your houseplant happy and healthy by repotting. You’ll want to move up in pot size to give the roots room to stretch and grow. Easy DIY tutorial idea. Spring is here, but there are days here in Utah when it feels like we are still in the dead of winter. I am so excited to go out in the warm sun, sit and do nothing. As I sat in my house the other day wishing for it to stop snowing, I was looking at some of my sad houseplants. It had been a long time since I repotted them. Then it hit me, I should show you how to repot a houseplant! These are the two plants I decided to repot for this round. 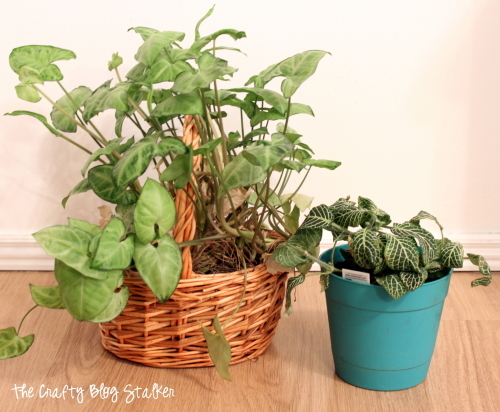 Repotting really is quite easy and you don’t need to worry about killing off your plants. They actually like it! A new pot gives them more room to grow and new soil. I like to think it makes them smile. The one in the basket is growing very nicely but there were lots of dead leaves in there. The one in the smaller pot had been over watered, and I have had a hard time getting it back to regular. The soil was just to wet. The soil I picked up at Walmart. It isn’t anything very expensive and it is pretty cheap. I like this bag because it has a zip top closure. I found this green pot at my local craft store and completely fell in love with it. It isn’t very big and it doesn’t have drain holes, so I know I will probably need to change it out again in 6 months or so. It was just too cute to pass up. Since it doesn’t have drain holes the first thing you want to do is add some rocks to the bottom. This is so if it does get over watered again, the water will have somewhere to go and sit while it waits to be soaked up.If it weren’t for the rocks it would just at the bottom of the pot with all of the soil and cause the bottom roots to rot. I forgot to take a picture of the rocks, but trust me they are there. 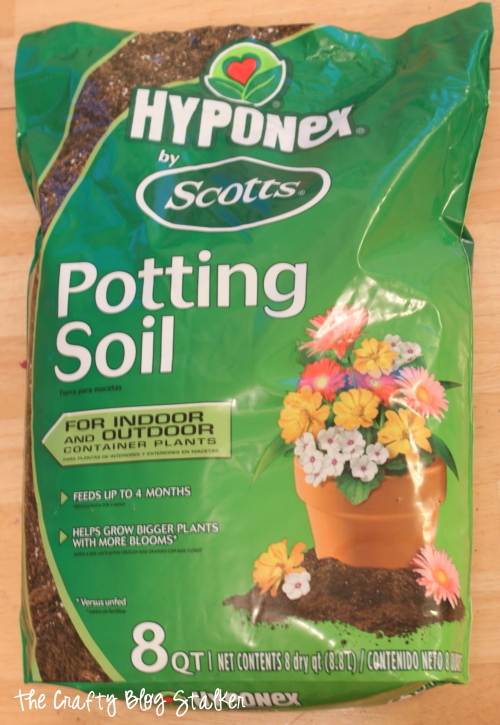 Then I filled the pot about 1/2 way with soil. 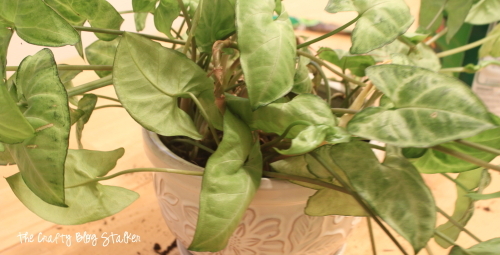 I took the plant out of the other container by turning it upside down and gently pulling on the base of the plant. 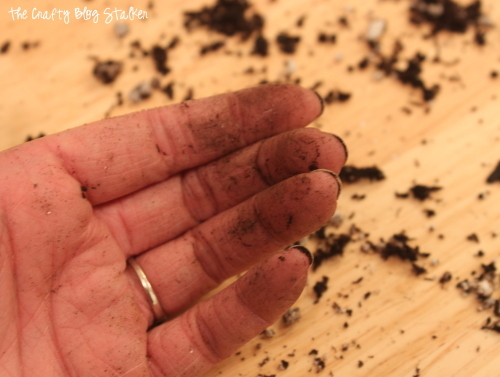 If it doesn’t come out easily you can dig around the soil until you loosen it. Look closely at the roots and carefully pull the clump of roots apart. You do this to create a little breathing room for your plant. If any part of the roots are black, that means they are dead. It is okay to cut them off or pull out gently. Oh and if you’re not getting dirty, you’re not doing it right! 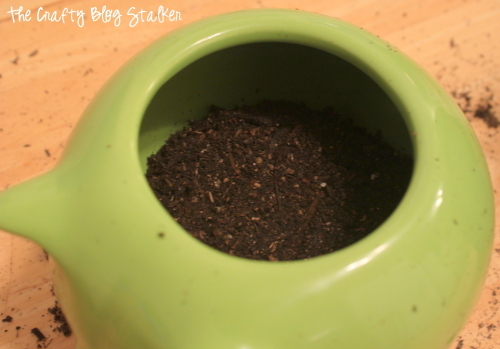 Slip the plant into the new pot and fill around it with more soil. You want to leave about 1 inch from soil to top of the pot. Water your plant well this first time, but be careful not to over water. This first water will help get rid of air pockets. You may need to add a little bit more soil after it settles. Really that is it! See. Easy-peasy. I wanted to make sure that I wouldn’t over water my plant again. So I purchased Wormie the Water Sensor. He changes color with the amount of water in the soil. Isn’t that the most fantastic thing? Before I put him in the plant I soaked him in a bowl of water for a couple of minutes. 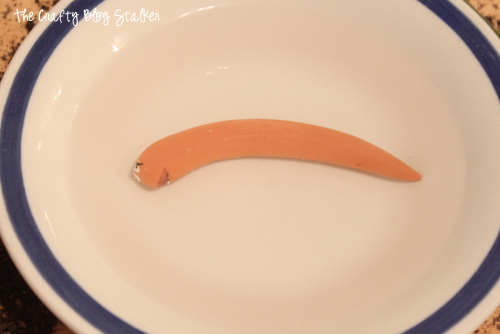 After his soak, he turns a clay red color and I inserted him into the soil of the pot. When he starts to lighten that means the plant needs water. So smart, and he is just so cute peeking between the leaves! I also repotted my larger plant. It was bigger than I thought it was, so this pot won’t be it’s home for too long, but it is still fun to give it a fresh new look. Here are my two plants in their new little homes. I am pretty sure they are both smiling, and I definitely am! How many plants in your home are ready for an upgrade? Share and leave a comment below! 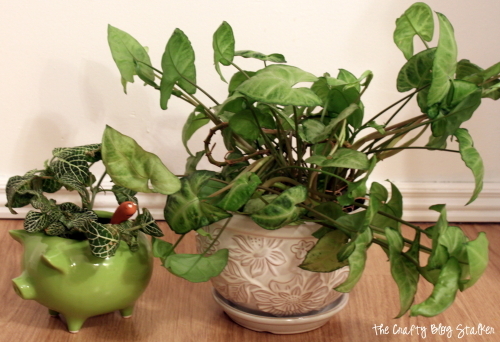 SAVE HOW TO REPOT A HOUSEPLANT TO YOUR FAVORITE DIY PINTEREST BOARD! I love houseplants and have way too many in my house. 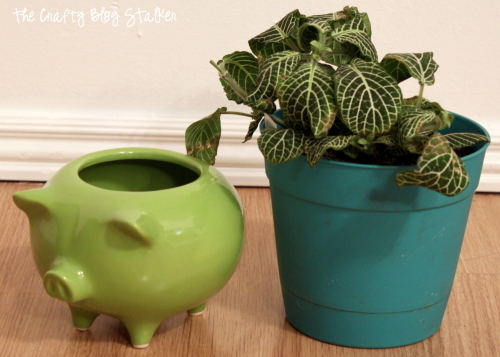 That green pig planter is adorable! I have re-potting on my list of to-dos for this weekend. It’s not my favorite thing to do. I feel a bit more inspired after viewing this blog…thank you! Timely! I have one in my studio that really needs to be repotted! 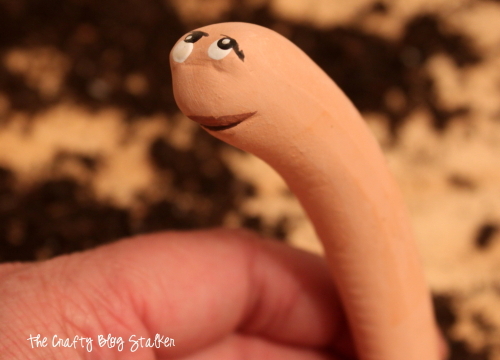 Totally getting one of those worms because I am always forgetting to water and he’s stinkin’ cute. Your blog title made me laugh outloud and with my stressful morning, it was needed – so thanks! This is a great tutorial thank you! I have a black thumb and my hubby wanted house plants so bad. I told him he had to take care of them but of course, I’m the one who has ended up caring for them. But so far they are all still alive! I definitely need to do some re-potting though. This is super helpful! Found you on the Blogger’s Digest! 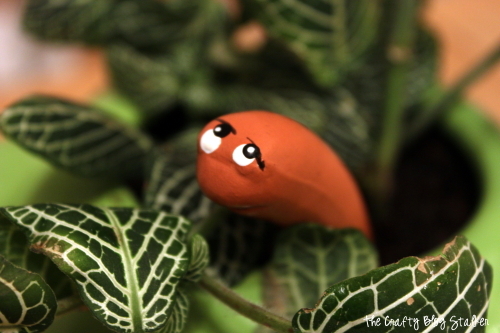 now that is cute with that little helpful worm, and i love having greens like that in my house. Thank you so much for writing and sharing this post!! I have four beautiful houseplants that I struggle to keep alive. truly struggle. I think I’ll consider repotting two of them to see if that makes them feel better.